Open Heart Diamond Necklace in 16"
This beautiful open heart diamond necklace in 16" from Apples of Gold Jewelry is a beautiful way to express your love for the special woman in your life. Created from a stunning 14K white gold, this beautiful heart necklace features an open design, and the white gold is created with thirty two diamonds, which are of G-H for color quality and I1 for clarity, and total 0.25 carats total weight. The heart of this necklace measures 0.65 inch by 0.57 inch in size, making it an ideal necklace to pair with just about anything! 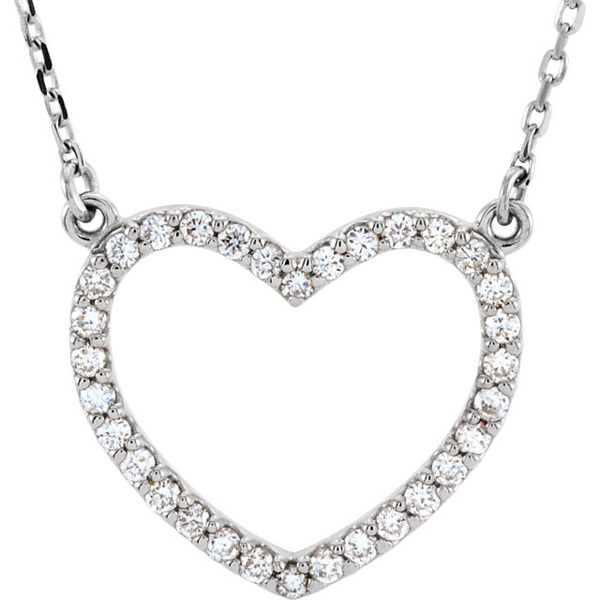 We guarantee our Open Heart Diamond Necklace in 16" to be high quality, authentic jewelry, as described above. 14K Yellow Gold Open Heart Diamond Necklace in 16"